In 1940 the release of "His Girl Friday" directed by Howard Hawkes and starring Cary Grant and 4 time Oscar nominated actor Rosalind Russell was a noteworthy film . This film has more words spoken per minute than any other In American film history .The effect and the chemistry between the two stars make it the kind of film that has you glued to your seat in anticipation . The pace is fast, the professionalism and synchronicity between Grant and Russell is absolutely irresistible . It is FUN. I worked with a great Hollywood producer named Bob Degus who directed me on Theatre Row. Bob had me study Roselind in scene one of "His Girl Friday ". Specifically Russell's confidence , her pace and get -down -to -business attitude . She was elegant and held upright but she was on a mission in scene one to begin her life again with promises from a new fiancé. 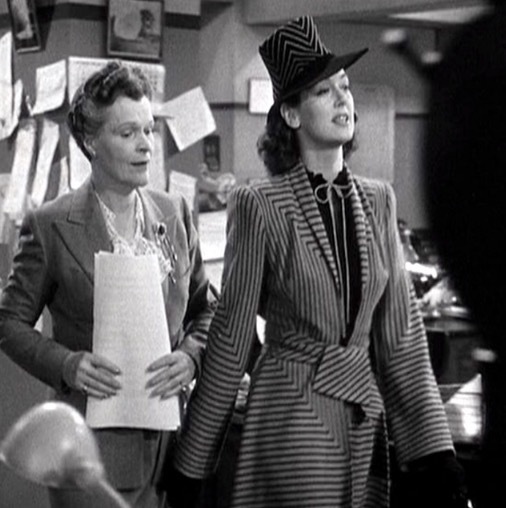 Rosalind played Hildy in this scene with dignity but moving as if her life depended on it . Hildy's fiancé had more holes in his plan than Swiss cheese but Russell's character Hildy was racing into her bad decisions beautifully. Hildy reminded me of a large cat dodging across the wild, ducking down, swerving around like a Panther. I imagined her as the sleek Panther moving as fast as flash of lightening for the things she never got out of marriage #1 to none other than Cary Grant who, in this film foils her plan perfectly . As an actor , film study is part of the job. To see other actors and their choices and physical qualities expands our possibilities in the present and informs us in stage or on camera . Recalling our own feelings as we watched can certainly spur our imagination just as reading a great novel can conjure images . Seeing Rosalind with her head high over and over , looking closely, feeling her feeling , imagining her story, recalling stories from my own life in my past of urgent times and need to "move forward", I fused all of this and whipped up an emotional soup. I brought those qualities and energy to My character Rita Hayworth every night as I moved "with purpose" onto the stage for my scene 1. Thank you to Bob for that super direction. Ironically , "Forward Moving" is a theme in my 2018. Let's move it kids! Hildy and her forward moving energy.